Their silence is kind of gross. I'm going to try and get a refund soon because it's practically unplayable. 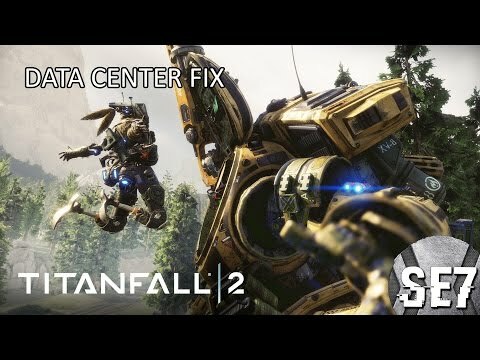 I really hope Respawn gives an update on this, cause I'm starting to see more people experience this issue. Three days of playing on this router was followed by being incapable of playing... then this morning - fine again. It's going to be server-side and likely poor load handling. Telling people to buy new routers is just ridiculous and utterly unhelpful. Ok, you guys are right. putting my PC in DMZ does not help. The problem is back again !. I feel ignored, not a nice feeling. Well good news - Netgear D7800 X4S has resolved my issue - no problems whatsoever now - and my in game ping is 30ms instead of 50ms when i had a good game before - router has improved all sorts about my internet conneciton in general - however the game clearly has issues with UDP/UPNP or similar that was interacting badly with my old router - no other games have had this so the game needs to be fixed. Wish respawn would comment. What system are you on? What router did you have before you made this change? How many games have you consistently played? Changing network settings, changing firewall, changing AV etc etc etc on PC. Changing to DMZ, enabling port forwarding, reducing router firewall on router (Technicolor TG589vac - super cheap VDSL modem supplied by UK ISP SSE (Southern Electric) which is actually "Daisy Internet wholesale" sold as 76d/20u - commonly get 68-70 down and 18-20up. Ping to Datacenter is alwasy sub 15ms with or without issues, internet ping and performance in general is as per expected above. When I did have working games (always just after a router reboot) i had a 50ms+/- ping. Wireless from the TG589vac has always been miserable with spotty coverage and dropouts - to this end I disabled the wireless on it several months ago and plugged in my old BTHomeHub5 (wired) and used that as a wireless bridge - to great results (Fixed problems I had with Steam Link streaming over wifi) I also have a ASUS POE68 wireless card: https://www.asus.com/uk/Networking/PCEAC68/ and that always gets a great rate to the router (600mb+). Now I have the Netgear Nighthawk D7800UKS X4s - a netgear ac wireless router with builtin VDSL modem - and it works a charm - data rate to PC is now 1gbs via wifi for example, sync speeds with ISP are higher and more stable (bandwidth graphs are smoother as delivery is better) so now syncing at 72+ and 20 down everytime, in game I now get 30ms+/- ping. Played 6 games in a row last night, switched game modes (attrition/amped hardpoint/mixtape) etc and no problems, quit game, rebooted PC and still managed to get straight into another game of attrition without problem. Will see what it's like again tonight but considering how everything acted before I'm full of confidence that swapping my router has resolved the issue. 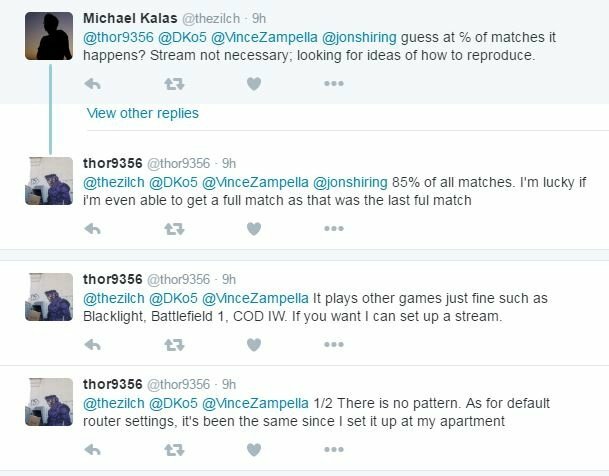 I'm not suggesting for a minute however that respawn should let this be the fix, the fix is clearly something to do with how the game interacts with the router and as such should be patched. Never told anyone to buy anything. Simply stating what worked for me. I'm playing every game now just fine in peak hours. Thinking your going to get a refund is laughable because a lot of people are playing this game just fine. Well there are few different issues that fall under the same symptoms being addressed here. While acquiring a new router won't help everyone, for those with certain models it certainly has helped. And while I won't tell anyone to go get a new router, for now, that is the only easy way to fix it unless you direct line straight into the modem. 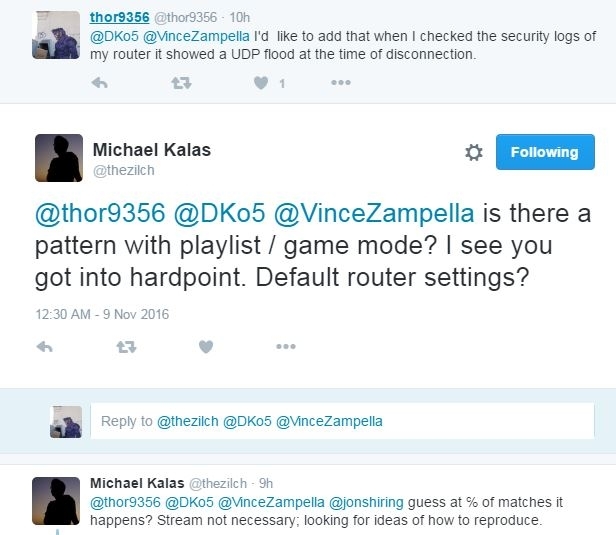 So clearly, the router is an issue, and unless it doesn't work at all, or there is something else going on that isn't being addressed, I'm fairly convinced that for some of us with "cannot connect to server" issues, it's simply a false flag UDP flood due to the way the network side of things is coded. Unlesz you can turn off your router's ability to deal with such events completely, there is little you can do client side. This is a programming issue, and one that may take time to fix. Perhaps they are waiting to push out a bunch of smaller fixes at once? Hopefully Respawn is just working on testing it internally with our collected data and isn't intentionally ignoring us. I have some difficulty believing they would do that, especially with how vocal they have been with players in the past. Bought the CD version on Monday, but due to some disc errors I downloaded it, so I guess I could say I got it digitally. I tried to connect via phone hotspot but nothing changes. Just how concerned are Respawn about this? So last night I was actually able to hear some update on the situation on twitter last night. It transitioned from the CEO to the Producer and then a couple of engineeers on this issue. I'll post a few links, but something is better than nothing. Edit: These aren't in order I know. Well that's a relief, hope they patch it soon. None. 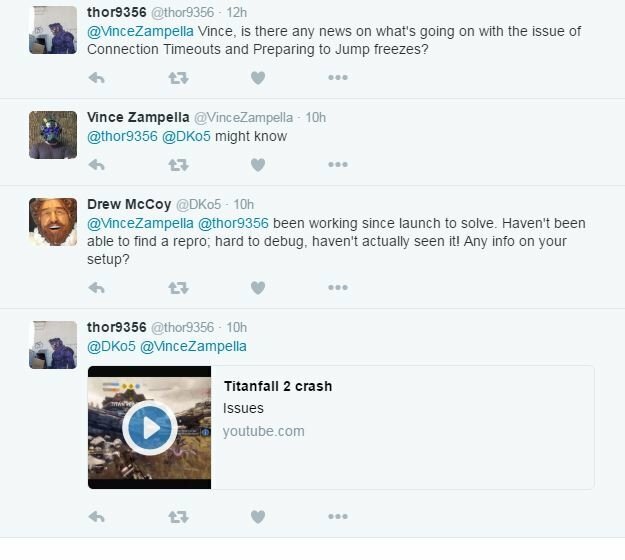 All I can really say is show gameplay footage of it, tweet the devs that were in that twitter discussion. Try and reach out. We haven't heard anything from the CM so that means it's up to us to contact the devs. True, but adding in what you notice and additional details so that the can recreate the problem is a step in the right direction. The reason they didn't do good in sales was because of the release date they chose. With Battlefield 1 coming out the week before and COD:IW the week after. It was a bad idea to release the game in that month. Had it been released during the winter or spring then it would probably be a different story. the game is working from 1 am to 3 am Egypt time then i got kicked from the game with the same message "server time out"
it almost every day this happened i don't know why? Welp, the game is now unplayable. I used to be able to (somewhat) play without disconnecting, but now the server will not let me connect. Like AT ALL. You join, you wait, you connect, you disconnect, you launch multiplayer, you search for a game, repeat. I requested some help from Respawn and EA, but no response. Whatever they're doing to the server, it isn't helping. I waited to buy this game for this very reason.. I was afraid there would be server issues despite my FANTASTIC beta experience using the exact same network/settings that I owned during the beta. But now I can't even connect to a game.. and it times out. Every once and awhile I'll get into a game. But I have yet to finish ONE game. Every single game I've played, I've gotten timed out at a random time..